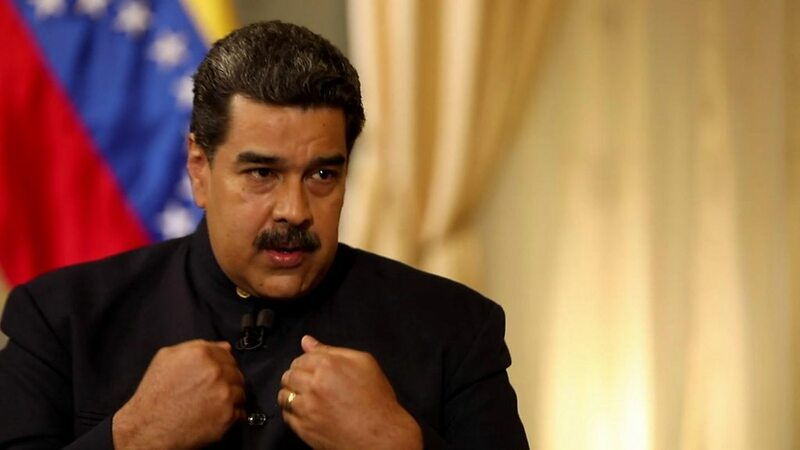 Venezuelan President Nicolás Maduro, in an interview with the BBC's Orla Guerin, accuses U.S. President Donald Trump of being openly a white supremacist who is "warmongering against Venezuela", saying that "the Ku Klux Klan is running the White House". Venezuela's embattled president tells the BBC the offer of aid is an intervention plan by the US. 2019-02-18 In a speech, U.S. President Donald Trump urges the Venezuelan military to abandon Venezuelan President Nicolás Maduro or "lose everything". 2019-03-4 Venezuelan National Assembly-declared interim President Juan Guaidó defies Venezuelan President Nicolás Maduro's threats and returns to Venezuela where he is received by tens of thousands of people in Caracas. 2019-03-28 Venezuelan state comptroller Elvis Amoroso announces that opposition leader Juan Guaidó is barred from holding public office for 15 years because of irregularities in his financial records. Guaidó, the National Assembly President, says he will continue his campaign to oust President Nicolás Maduro. 2019-03-12 The United States Secretary of State Mike Pompeo announces that the U.S. will be withdrawing all remaining diplomatic staff from Venezuela. The withdrawal follows televised remarks from Nicolás Maduro calling "colectivos" (paramilitary groups) to active resistance, and alleging that U.S. President Donald Trump masterminded the ongoing nationwide power blackout as part of a "demonic plot" to oust him, by crippling the country's electricity sector with an "electromagnetic attack". 2019-04-19 The White House says President Donald Trump has spoken to Libyan Field Marshal Khalifa Haftar about recent developments in Libya. During the call, Trump recognised Haftar's efforts to combat Islamic terrorism and secure Libya's oil reserves.